I'm finding it hard to be objective about this episode, but I'll try my best. Since I loved the last season as a package, I found it really easy to get through any slow periods of this episode (based on mood, there can be a few). Getting reacquainted with the characters was the challenge, and Wiki helped a lot with that. This season picked up as though S1 had just ended, probably turning off any new-viewers. 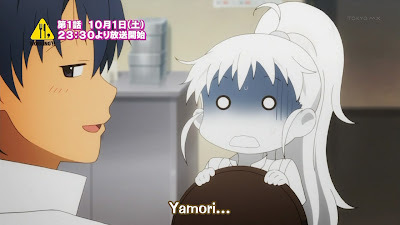 (For some reason, I could not remember who Yamada was, and had to explicitly look it up to recall.) There weren't any spoilers in this episode or anything, so it'd work well for an inquisitive mind that wants to know what Working!! is all about. The episode began with a rolling shot of the neighbourhood, as Taneshima made her way to work. At Wagnaria, Inami arrived and changed only to be told by Kyouko that they had no more work to do. 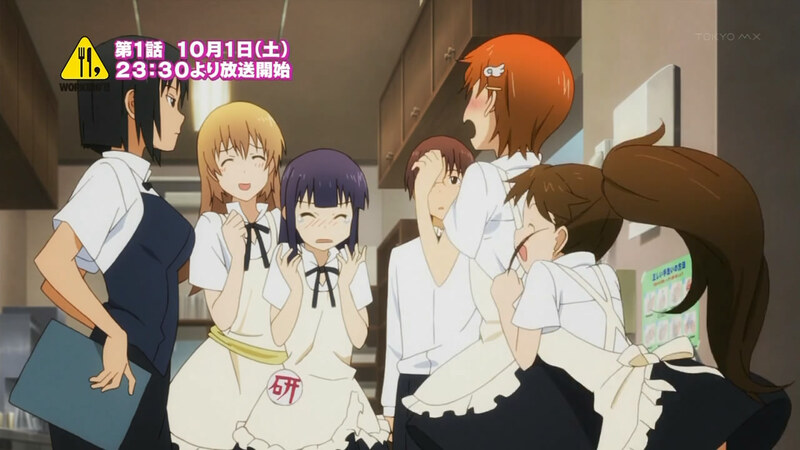 Possibly as a jab at other anime that attempt to use a "going out of business" storyline as a finale, Inami assumed that Wagnaria was closing. 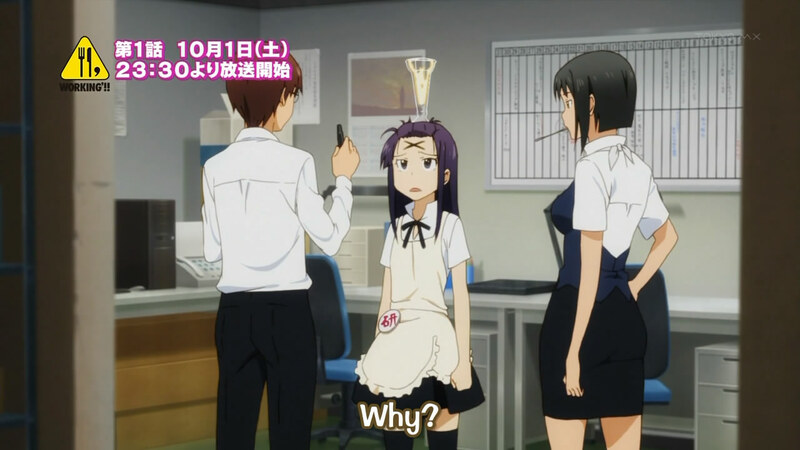 The reality was only that Takanashi had completed all the "prep work" at the front of the house, leaving the others with nothing to do until customers arrived. After a quick "reunion" of the characters, customers showed up and the episode really got underway. The quick scenes thereafter showed some of the quirks of the characters. I always liked that there was something "note-worthy" to each of the characters, as though it were straight out of a one-liner biography. Todoroki's katana continued to worry customers, Inami continued to be unable to hang around men, Yamada continued to randomly break dishware, and Taneshima continued to be completely obsessed with her height (and lack there of). The last thing, in fact, made up a good chunk of the episode, as it caused an argument between the chibi-sized girl and Takanashi. 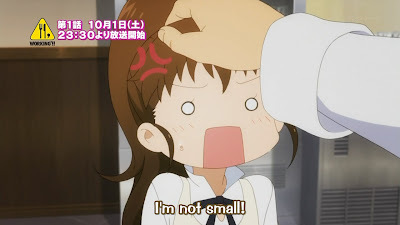 Taneshima finally had it when, as Takanashi petted her as a greeting and called her cute for being so small, he also announced that he would never see her as not cute, and "broke up" with him (in entirely platonic ways). 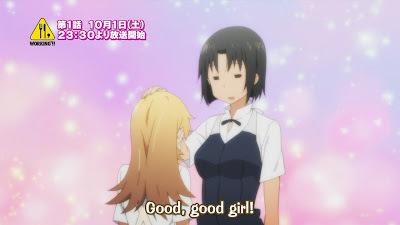 While he was beaten up by the passing-by Inami, Taneshima went to Kyouko for comfort. Todoroki, nearby the manager as always, affirmed that such words were terrible (although for entirely different reasons), leaving Taneshima entirely sure of her decision. 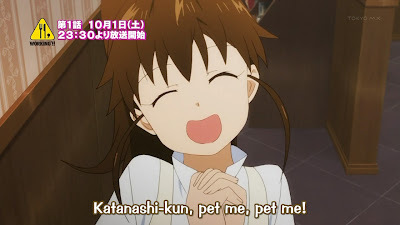 I've never really found Inami to be that interesting, and so Takanashi attempting to assist her with her androphobia (again) didn't really grab my attention. He advised her to try and hold back her violent tendencies, which seemed much, much harder than assumed. What an about-face. I'd be suspicious. 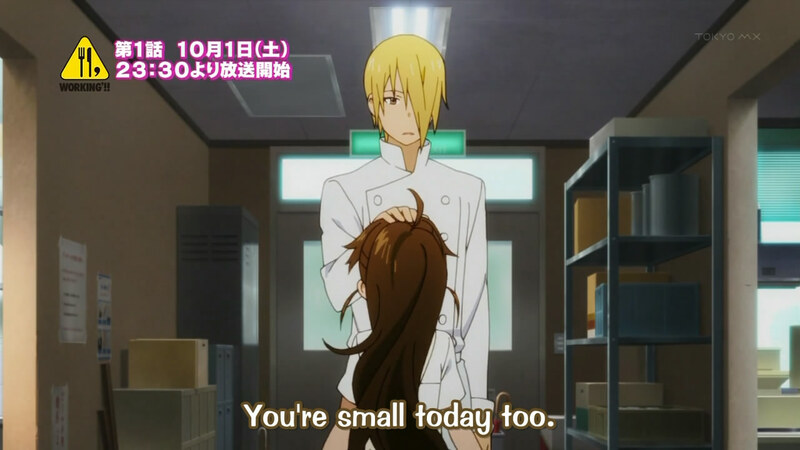 Souma and Satou, the entirely-too-mischievous chefs, spoke to Taneshima by-and-by, and it was Satou that decided to get her to forgive Takanashi, by using some magic words: it would be adult thing to do. As Taneshima hopped away to forgive Takanashi and simply put up with his overbearing "festishes", Satou revealed to Souma that if the cold war continued, Taneshima might quit, which could lead to Takanashi quitting, which would lead to an uncontrollable Inami. Ah, cascade failures. 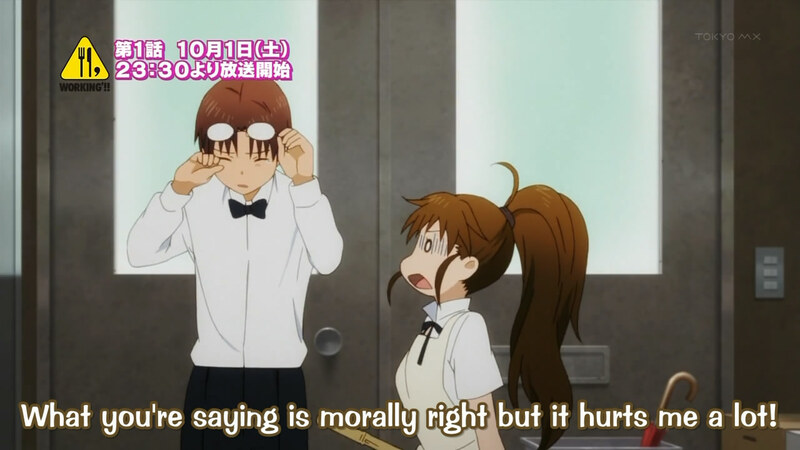 It's pretty rare to see conniving men in an anime so full of women, by the way. As Taneshima and Takanashi took care of the snow outside, Todoroki ran screaming from a bug. Being as tsundere as he is, Satou chided her about it instead of killed it for her. When Kyouko took care of it for her, Todoroki was once again "stolen" by the manager. The scene wasn't about the Sanji-lookalike and his secret feelings, though; Takanashi, upon returning indoors, was appalled at what the manager had done. In a strange twist of words, he likened the killing of a bug to the killing of Taneshima, since they were both tiny and cute things. The situation itself wasn't bad; these people seem pretty used to each other's weirdness at this point. 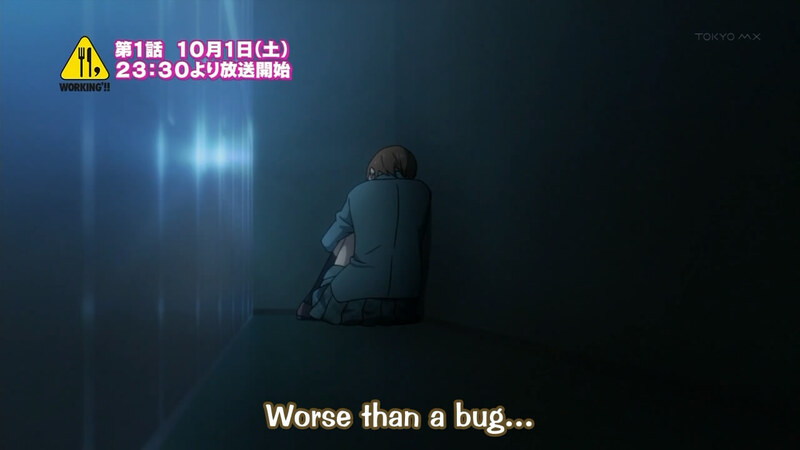 The only casualty was Inami, who was hurt when Takanashi said she was worse than a bug. This was a wound that she carried with her for the remainder of the episode. It's okay. I recently found out I love octopus. You'll live. Well, he holds "bugs" in pretty high regard, so it's not so bad. The first episode of S2 didn't feel like a first episode at all; rather, it actually felt like it was truly a continuation of the last season. Like I suggested earlier, watching this episode to gauge what type of anime this is would be a good idea; it's right in the middle of the story without having spoilers. On a final note, I hate how my tag can't have exclamation marks. It's "Working'!! ", after all. Sadface.